Myanmar President Htin Hyaw has pledged to deepen bilateral ties with Vietnam and promote all-level visits and meetings during his meeting with Party General Secretary Nguyen Phu Trong in Hanoi on October 26. The President, who is in Vietnam for a State-level visit, expressed his joy to visit Vietnam for the first time and spoke highly of the remarkable achievements Vietnam has attained over the past 30 years of renovation, under the sound leadership of the Communist Party of Vietnam. 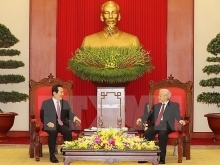 He updated the host on the outcomes of his talks with President Tran Dai Quang and the meeting with Prime Minister Nguyen Xuan Phuc, while affirming that he will work to develop the time-honoured friendship between the two countries. President Htin Hyaw also promised to expand trade-investment ties between Myanmar and Vietnam on the basis of mutual benefits, create the best possible conditions for business operations, enhance people-to-people exchange and coordinate closely with Vietnam in the ASEAN and at regional and international forums such as CLMV, ACMECS and the Greater Mekong Sub-region (GMS). 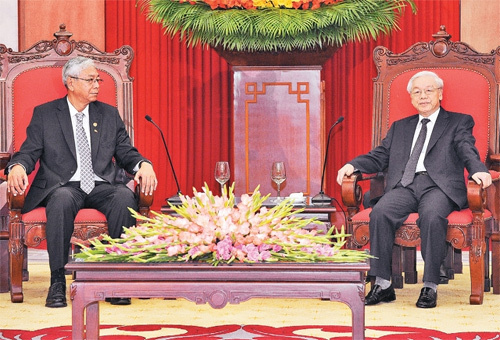 Party General Secretary Nguyen Phu Trong described the Myanmar President’s State visit to Vietnam as a significant contribution to opening up a new stage in the bilateral ties between the two nations, especially at a time when both countries have recently sworn in new leadership. He affirmed Vietnam’s consistent policy of attaching importance to fostering and expanding friendship and multilateral cooperation with Myanmar. The Party leader highlighted the similarities in the two nations’ history of struggling for national liberation as well as in their economic reform policies, saying that they serve as an important foundation for the two countries to further their friendship and cooperation. He expressed his wish that the two countries will maintain and make the best use of existing bilateral cooperation mechanisms, while boosting economic – trade and investment partnership, people-to-people exchanges and cooperation at local levels for mutual development./.